Bloom's syndrome is an autosomal recessive disorder characterized by distinctive faces, stunted growth, telangiectatic facial erythema, abnormal immune response and predisposition to various malignancies. Cytogenetically, it is characterized by increased frequency of spontaneous sister chromatid exchange. A 10-year-old boy born of third degree consanguineous parents was referred by pediatricians with complaints of rashes over face which started 6 months after birth. History suggestive of photosensitivity was present. 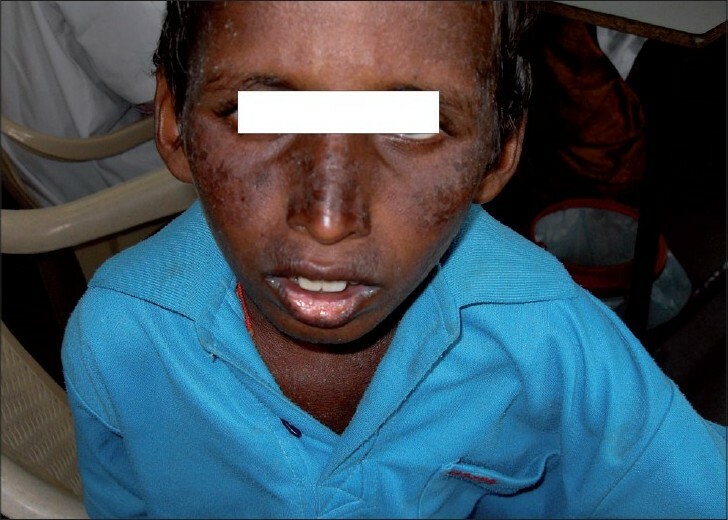 Examination revealed erythematous scaly plaques with telangiectasia over butterfly area of face, neck, ears, and lower lip (mainly over the sun-exposed areas) [Figure 1]. The child also had prominent nose, narrow and slender faces. His physical growth was stunted. On the basis of the above mentioned features, we diagnosed Bloom's syndrome in this patient. 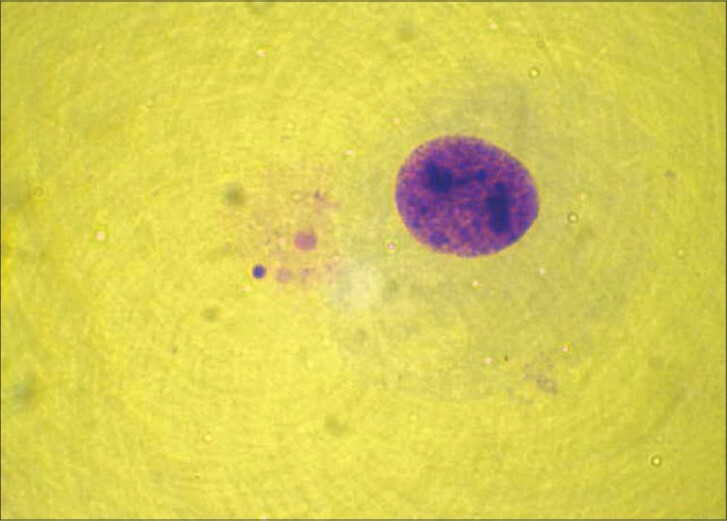 Cytogenetic study was done for the patient. 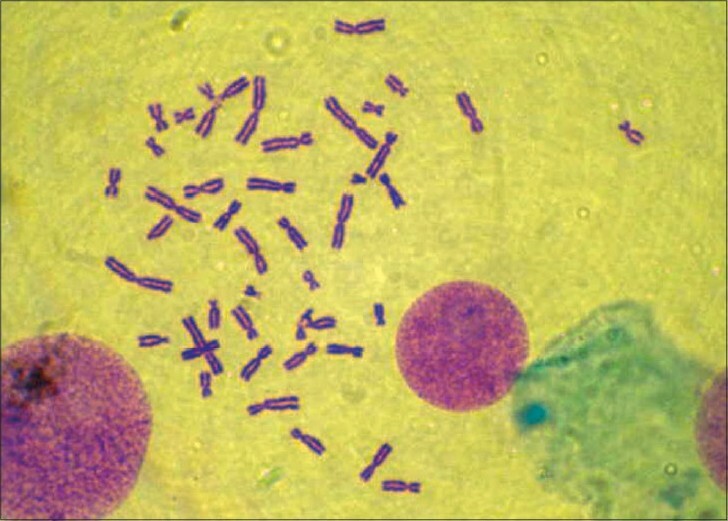 Leukocyte culture of the individual showed a normal karyotype 46 XY but with 20% aberrant metaphases with chromosomes showing breaks, fragments, and micronucleus [Figure 2],[Figure 3]. Fifty metaphases were analyzed. The frequency of satellite association (SA) was 32% [Figure 4]. Similar cytogenetic study was also done on four controls and results revealed average of only 11% SA. 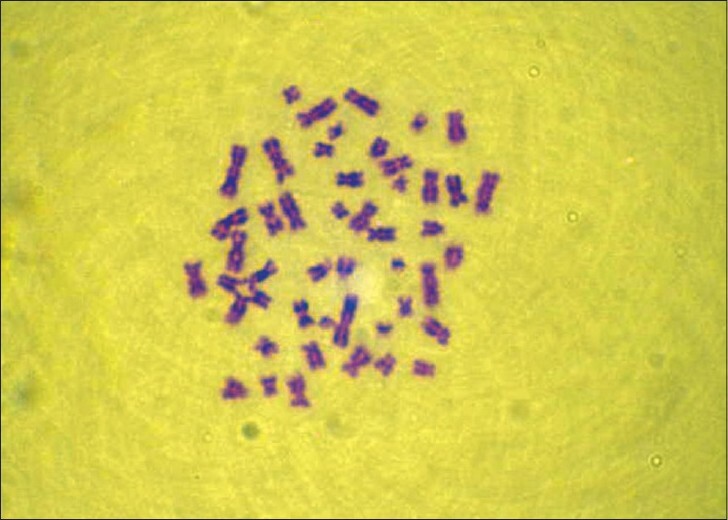 In vitro leukocyte culture of the same child when exposed to ultraviolet (UV) radiation showed 80% aberrant metaphase with chromosomes showing quadriradial figure, multiple breaks, gaps, fragments, and increased incidence of micronucleus [Figure 5]. The frequency of SA also increased to 84%, confirming that when there is an increased evidence of unstable chromosome on exposure to UV radiation, there is also an increased incidence of SA, an indicator of defect in the DNA repair mechanism. Authors feel that cytogenetic studies in genodermatoses like Bloom's syndrome would help not only to prevent the severity of the disease with passage of time, but also to detect skin malignancies that are liable to occur. 1. Vishwanath A, David S, Rajangam S, Thomas M. Down syndrome: Acrocentric association. Ind J Hum Genet 1996;2:131-4. 2. Lezhava T, Tsigroshvili Z, Dvalishvili N, Jokhadze T Mathematical model for satellite associations of human acrocentric chromosomes. Georgian Med News 2008;164:90-9. 3. Rosin MP, German J. 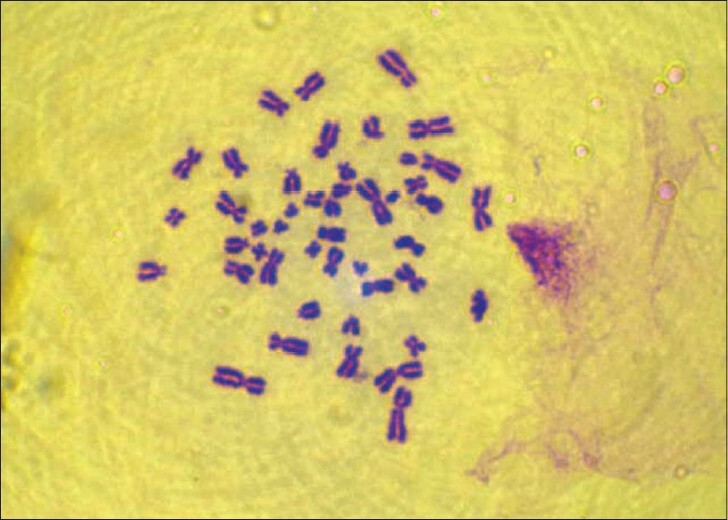 Evidence for chromosome instability in vivo in Bloom syndrome: increased numbers of micronuclei in exfoliated cells. Hum Genet 1985;71:187-91. 4. Froath B, Schmidt-Preuss U, Siemers U, Zollner M, Rudiger HW. Heterogenous carriers for Bloom syndrome exhibit a spontaneously increased micronucleus formation in cultured fibroblasts. Hum Genet 1984;67:52-5. 5. Bonassi S, Znaor A, Ceppi M, Lando C, Chang WP, Holland N, et al. An increased micronucleus frequency in peripheral blood lymphocytes predicts the risk of cancer in humans. Carcinogenesis 2007;28:625-31.